Human-wildlife conflict leading to wildlife mortalities is known to result in population declines, especially for slow-breeding megafauna such as elephants and tigers. While conflict situations involving large herbivores and carnivores often lead to loss of human life, limb and property, they also result in retaliatory killing of the individuals involved and sometimes of many more individuals of the species indiscriminately. In many parts of India, lesser charismatic species such as sloth bears are also known to come into conflict with humans regularly, for instance in the eastern state of Odisha, where today human-sloth bear conflicts are becoming a growing concern. Characterised by a shaggy black coat, a bare, protruding snout, and an arched back, the sloth bear is an omnivore — relying primarily on insects, fruits and flowers, for its daily meal. With poor hearing and eyesight, they many a times unknowingly come within close range of humans and other adversaries, almost invariably leading to aggressive interactions. Their formidability against large predators such as tigers is also well-documented, especially of females with cubs, who will go to extreme lengths to protect their cubs. Although sloth bears tend to avoid human proximity as best as they can, they show a low tolerance to humans when they inadvertently come across each other. This aggressive nature of sloth bears, and their armament of long sharp claws on their powerful forepaws (meant for digging) and four large canines, proves extremely detrimental to humans when sloth bears do decide to attack. In Odisha, between 2014 and 2018, 716 attacks by sloth bears on humans were recorded, accounting for the highest number of human casualties due to wild megafauna in the state. In comparison, only 405 human casualties due to Asian elephants were recorded in the state during the same period. Nonetheless, sloth bear attacks leave far more grievously injured human beings than any other large wild fauna. For instance, out of the 716 attacks recorded, 627 humans were left grievously injured — with many victims severely impaired for life. Perhaps it is this outcome of fewer human fatalities that garners lesser attention on human-sloth bear conflicts compared to conflicts with other megafauna like elephants, leopards and tigers. For instance, in the 405 elephant attacks recorded during 2014-18, more than 50 per cent led to human deaths, while just 89 human deaths occurred due to sloth bear attacks in the same period — a mere 12.4 per cent. Nevertheless, the repercussions on the species is no less severe, even if it doesn’t end up killing more humans! Human-wildlife conflicts not only create a greater public antipathy towards wildlife and conservation efforts, but at the proximate level, also lead to an increased loss of the species in question. Many a times, in areas with high conflicts, indiscriminate killing of individuals of the species occur in retaliation. And when this occurs, the brunt of the conflict is borne by sloth bears and other large carnivores alike, despite them being given the highest level of protection (Schedule – I) under the Wild Life (Protection) Act of India, 1972. Retaliatory killings thus pose a serious threat to sloth bears that come into conflict with humans regularly, and are today regarded as a major conservation concern, besides other threats such as poaching and habitat loss. This risk runs deeper for sloth bears, as no concrete population estimate exists for this species in India. Sloth bears also face a threat from poaching due to the demand for their gall bladders — used for traditional Chinese medicine prepared with bear bile, and in Odisha, also for their meat. Retaliatory killings therefore add on to the already unaccounted sloth bears deaths. 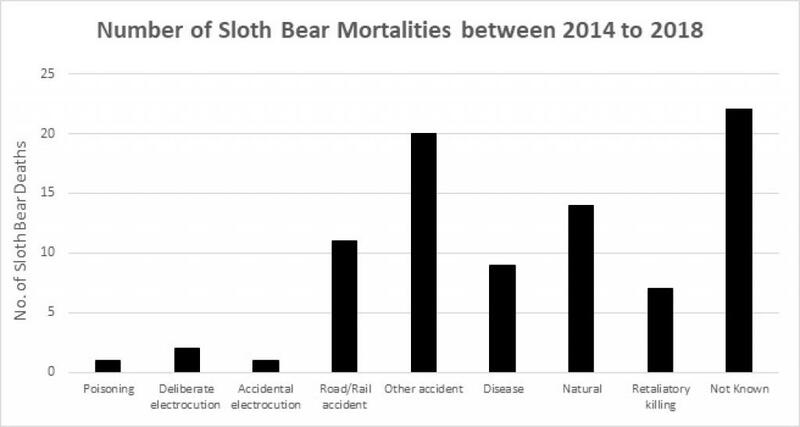 In Odisha, around 87 sloth bear deaths were recorded between 2014 to 2018, of which 10 were ascribed to retaliation by humans (including poisoning and electrocution), and 22 and 20 deaths were categorised as ‘Unknown Cause’ and ‘Other Accidents’, respectively. An additional 23 deaths were marked as ‘natural deaths’ (including deaths due to diseases) and 11 more ascribed to road or rail accidents. The highest recorded deaths were recorded from Nawrangapur, Koraput and Keonjhar, Dhenkanal and Behrampur forest divisions, while several other divisions have also reported wildlife deaths in the last three to four years. An independent survey in the Balasore Wildlife Division, reported around 167 reported conflict cases involving sloth bears that led to 201 human casualties (including four human deaths) and seven retaliatory killing of sloth bears, over a 12-year period from 2002 to 2013. The study suggests that conflict cases peaked during the monsoons (July to October) which is the peak agricultural season. While sloth bears depredate crops to a very low extent, in fringe forest areas, they do venture into crop fields and inadvertently come close to humans, leading to attacks. Sloth bears are also in particular, known to be attracted to mahua (Madhuca indica) flowers, which is widely used in the Central India landscape including Odisha for brewing liquor. Consequently, many conflicts also occur when people encounter sloth bears during the harvesting of mahua in the forests. Such an increase in sloth bear attacks on humans in Odisha, the ensuing human deaths and injuries as well as the resulting sloth bear deaths, must be viewed as a wake-up call for the state. There is now an urgent need to address this issue and address it holistically so that long-lasting change can be brought about. With a surmounting number of conflict cases in Odisha, and the resulting deaths of sloth bears, it is imperative that stringent steps are taken to mitigate the issue at hand. Mitigating human-sloth bear conflicts must take a three-fold strategy to ensure holistic and long-lasting impact. Habitats of sloth bears are typically diverse, with a mix of fruiting trees, and a bountiful, palatable insect population. It is important that healthy habitat patches be managed to ensure minimal anthropogenic disturbances. Minimising extraction of minor forest produce such as mahua and honey, while also reducing firewood lopping, and grazing is a crucial measure. 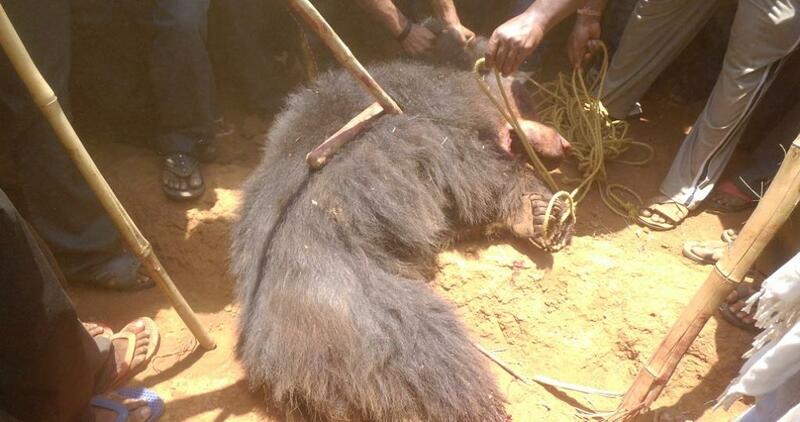 Further, in many places where sloth bears thrive, their denning sites need to be secured. Additionally, greater transparency needs to be built in across government departments, and sloth bear habitats need to be considered when diverting lands for developmental activities. This is crucial to prevent habitat fragmentation and degradation due to development projects that may limit the habitats for sloth bears, leading them to venture closer to human habitats. Developmental activities such as mining and stone quarrying can have devastating effects on the habitats, and such projects need to be considered with extreme caution. Developing the capacity of local people who commonly experience conflicts with sloth bears is also critical to ensuring long-term mitigation. On the one hand, installation of community-led deterrent systems such as solar power fences or other cheaper physical barriers, need to be fostered. On the other, communities need consistent sensitisation exercises to make them more aware of sloth bear behaviour and ecology, and thus, also the ways of avoiding conflicts. Such awareness may also prove useful in preventing conflicts and safeguarding bears, when sloth bears venture into human habitations, sometimes to den and litter. In areas where local communities depend extensively on minor forest produce such as mahua and honey, alternative set-ups such as community orchards, and apiaries need to be promoted within barricaded areas that prevent bears from venturing into them. Additionally, local forest department staff also need to be made aware of the underlying reasons of human-sloth bear conflict, and the ways to manage them. It is also of utmost importance that these staff are encouraged to create and maintain a dialogue with local people who face conflicts. Active management of conflicts is a crucial aspect of long-term conflict mitigation, as it not only contributes to the proximate mitigation of ongoing conflict situations, but also instil faith in local populaces of the management measures in place for their benefit. For this, establishing well-equipped and trained conflict mitigation teams or squads that ensure swift response and efficient redressal of a conflict situation through extensive and continuous monitoring, ensuring safe-passage or capture and translocation, is critical. It is also important that a larger network of volunteers or village responders is established across areas where human-sloth bear conflicts are the highest. These personnel require to be trained and equipped to not only provide information on conflict situations that arise, but also respond to them as a first line of defence to contain the situation and prevent it from aggravating into a serious situation by keeping local crowds at bay and monitoring the location of the animal involved in the situation. With such a multi-faceted approach, the rising trend of human-sloth bear conflicts in Odisha can be curtailed, and, while it would be impossible to eradicate such conflicts altogether, they can be efficiently managed so that aggravations are minimised, leading to fewer attacks on humans and fewer retaliatory killing of sloth bears. It is imperative that Odisha takes proactive steps to manage and mitigate human-sloth bear conflicts, lest the sloth bear also dwindles away like the state’s tiger and elephant populations, albeit unlike them, in a less apparent manner.